Saturday October 29th 1921 I was busy sewing most of the day. Hattie over to Mrs Swishers. I walked to town at 4 oclock. Met her and we went to a picture show. walked home. sewed in evening. Sunday October 30th 1921 Hattie to church. Cora busy at home. I wrote to Mrs Pickens before dinner. In afternoon wrote Lydia, Ida, Joe Woolf, and Betty Boswell for her birthday. Was down to Otts. It rained some. Ron & Cora out to supper. Mr Teeters called. Monday October 31st 1921 Emma was here all day making my velvet dress. Cora and I were in town for trimmings. She worked late to finish. I am very well pleased with it. Tuesday November 1st 1921 I cleaned up the sewing room and helped what I could before I dressed for the luncheon Hattie gave. The Kaspers had to go right away. Hattie and I did all the dish washing after Rob & Cora had supper and went to town. A pleasant day and nice party. I had letters from May, Lorie Foltz and Alice Condon. Her bro Charlie was buried the 2nd of the month. 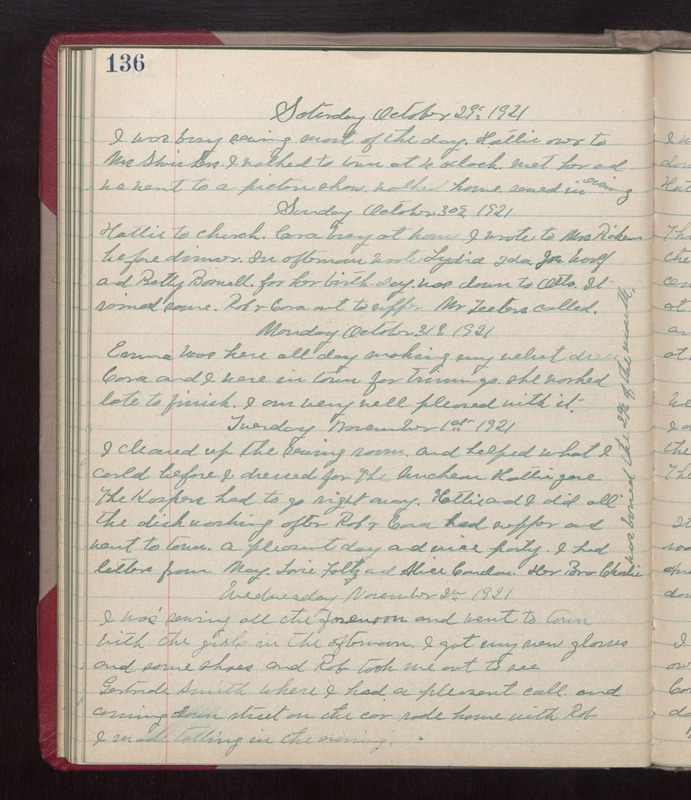 Wednesday November 2nd 1921 I was sewing all the forenoon and went to town with the girls in the afternoon. I got my new glasses and some shoes and Rob took me out to see Gertrude Smith where I had a pleasant call and coming down street on the car rode home with Rob. I made tatting in the evening.